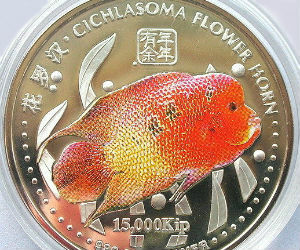 The LAOS Cichlasoma Flower Horn Silver and Gold Proof Coins pay tribute to a cichlid fish called Flower Horn Fish also known as Hua Luo Han. These large and powerful fish are only matched by their beautiful colors and the large nuchal humps on their heads. There are so many vibrant color variations of this fish available and fish enthusiasts believe that owning this fish will bring luck and prosperity to its owner and the bigger the head the more luck! In 2003 and 2004 the Bank of The People’s Democratic Republic of Lao authorized these coins which became an instant hit with cichlid keepers and coin collectors. The Singapore Mint received the Most Popular Coin Award for the 2003 Flower Horn Silver Proof Coluored Coin issued by Bank of the Lao PRR. There are three coins minted in silver and two coins minted in gold. The three silver coins are called Abundance, Flourish and Achievement. The coin called Abundance is unique because the fish is colored reddish orange from a color application process. The coin called Flourish features a multiple latent image and the Achievement coin showcases a background hologram. All of these coins are Proof Silver 15,000 Kip face value coins, 20 grams of pure (999 fine silver). The Abundance gold coin is 999.9 Gold BU with a face value of 10,000 Kip and the Achievement gold coin is 999.9 Gold BU with a face value of 100,000 Kip featuring a dynamic hologram background. The weight is 1/2 oz. Like all precious metals, silver and gold are good part of a portfolio from a investment perspective. These coins were minted in limited sets worldwide so their more collectible because of their uniqueness and limited availability. 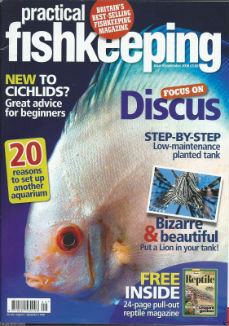 These coins make a great gift or present to that special someone, cichlid hobbyist or coin collector.